Mix the raspberries with the lemon juice, kirsch and icing sugar, cover and leave to steep for approx. 30 mins. Puree and press through a sieve. Soften the gelatine in cold water for approx. 5 mins. Drain the gelatine, dissolve in boiling water, mix together with 4 tbsp of the mixture and immediately stir into the remaining mixture. Chill until the mixture is slightly firm at the edges, stir until smooth. Whip the cream until stiff and fold in carefully, share among glasses, cover and chill for approx. 4 hrs. Top with the raspberry cream before serving. 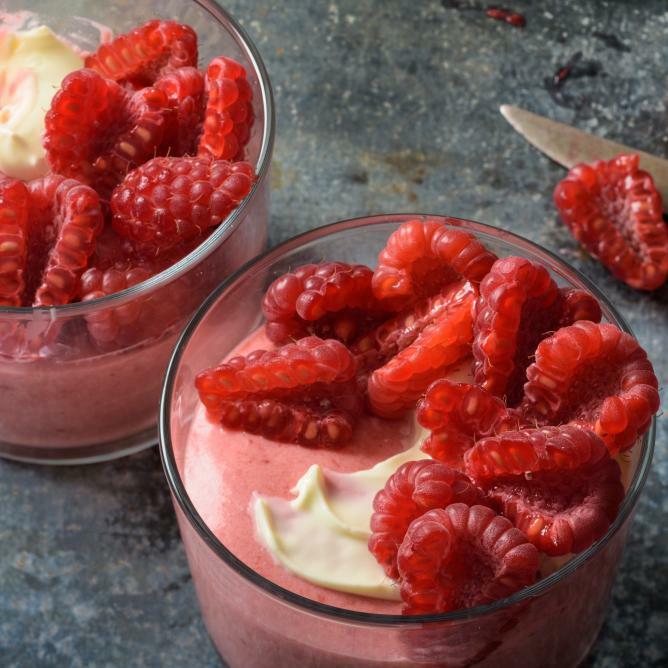 Replace the raspberries with blackberries.